St. Lawrence is located on the southeast coast of the Burin Peninsula. Until the early 1930s, the people of the area survived mainly through a combination of inshore fishing, small-scale farming, and other traditional activities. A tidal wave devastated the area in 1929; 27 people lost their lives, and many along the coast lost their houses, boats, stages and supplies. This added greatly to the hardship already inflicted by the Great Depression and the collapse of the saltfish trade. 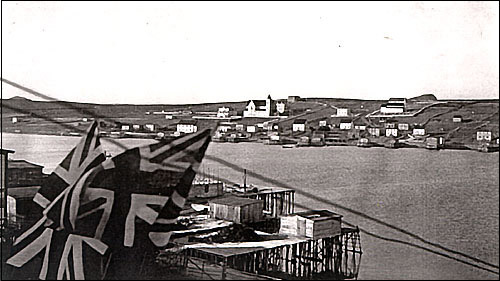 St. Lawrence is located on the southeast coast of the Burin Peninsula. The Catholic and the Anglican Churches can be seen in the background. Courtesy of the Town of St. Lawrence, NL. In 1931, an American entrepreneur named Walter Seibert offered the people some hope when he visited the town to inspect the fluorspar deposits he had purchased from St. John's businessman in 1929. Fluorspar is a non-metallic ore which, depending on the proportion of its components, is used in the manufacture of such things as aluminum, glass, and the refrigerant freon. At the time of its discovery, the St. Lawrence deposit was described as the largest in North America. 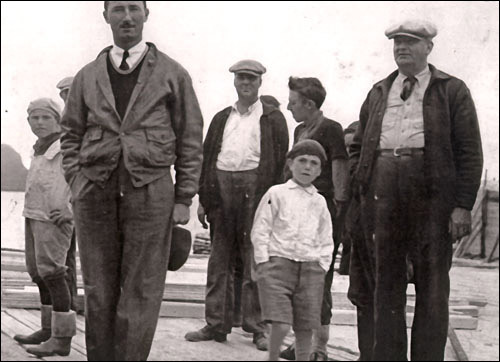 In 1933, the men of the area, eager for the promise of steady, paying work, began the arduous task of extracting and shipping the ore for Seibert's company, the St. Lawrence Corporation of Newfoundland (often called simply "the Corporation"). Seibert, a New York businessman, was interested in the fluorspar deposits at St. Lawrence. He was the first owner of the St. Lawrence Fluorspar Mine. Seibert is located in the foreground. Many in the area have attested to the back-breaking work and other sacrifices, including unpaid labour, endured to get the mines running. The first mines were little more than large trenches, and the workers were constantly exposed to the harsh weather. There was little or no powered equipment and no facilities for the workers. By the late 1930s, shafts had been sunk and most of the work moved underground. Over the ensuing decades, the St. Lawrence mines grew into one of the largest operations of its kind in North America. A miner mucking fluorite ore. Courtesy of the Department of Mines and Energy, St. John's, NL. By 1937, a second concern, the American Newfoundland Fluorspar Company was operating, at St. Lawrence. In 1939 its owner took advantage of the favourable markets which accompanied the outbreak of war, and sold out to the Aluminum Company of Canada (ALCAN), which formed the Newfoundland Fluorspar Company (Newfluor). The World War II years were active and prosperous ones for the area. Both the Corporation (which shipped its ore to a processing plant in Wilmington, Delaware) and Newfluor (which shipped to its aluminium works in Arvida, Québec), expanded their operations. The population of the town increased dramatically as many came to seek work in the mines or in other sectors, such as the hydro-electric and the service industries, associated with the increased economic activity. Surface works at Director mine. Photo by Rick Rennie, ©2000. By World War II then, and over a period of little more than a decade, the community and the immediate area had been radically changed by the introduction and expansion of this new industry. Besides the fluctuations which normally accompany the mining industry, the 1950s and 1960s were periods of general growth. During the 1970s, however, operations took a downturn. Competition from other sources, such as Mexico and South America, forced down the price of ore, and ALCAN began curtailing its St. Lawrence operations. Despite the efforts of the miners' union, the general population, the town council and other concerned parties, ALCAN closed down operations completely in 1978. Shafts were sealed, buildings levelled, and much of the physical evidence of the town's mining heritage was eradicated. 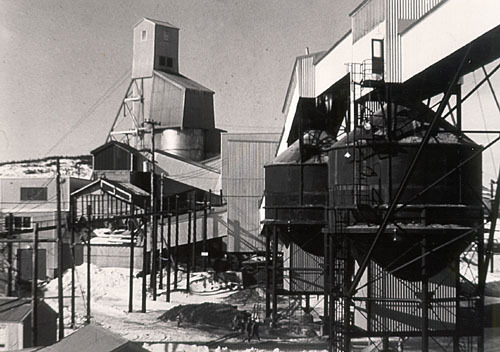 This picture depicts the Director headframe and mill as it was in the 1960s. The mine is no longer in operation. Since the closure of the mines, many people have left St. Lawrence, often to take up life in other mining towns elsewhere in North America. A modern fish plant constructed in the early eighties, and other economic activities have gone some way toward alleviating the hardship resulting from the loss of the area's key industry. 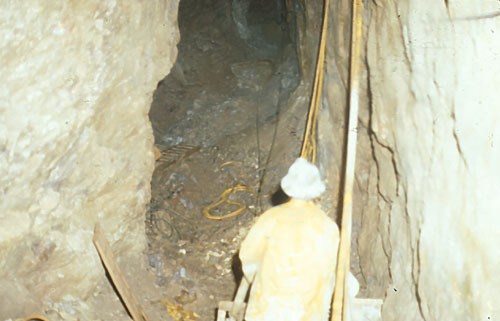 In the mid-eighties, a British-based company, Minworth Limited, reopened the mines on a limited and ultimately short-term basis, as it went into receivership in 1991. 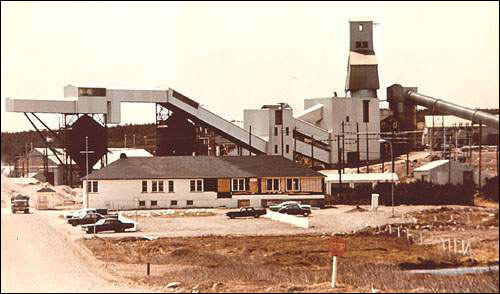 In 1995, another company, Burin Minerals Limited (BML), acquired the former Minworth property from the provincial government and carried out some early exploration and development work with an eye to re-opening the operation. In 2009, BML was restructured and became a publically traded company under a new name, Canada Fluorspar Inc. (CFI). An Environmental Assessment process was commenced in 2014 with the intent of resuming mining activities. New employment opportunities with CFI (as part of the St-Lawrence Fluorspar Project) were advertised in the fall of 2018. Some important reminders of the town's mining heritage remain. Sports facilities, such as a large Recreation Centre and gymnasium, and a curling rink, attest to more prosperous times. There is also the St. Lawrence Miners' Museum, where many artifacts, photos and displays document the town's illustrious past. The most enduring reminder of the past, however, comes in a darker form: the numerous deaths associated with fluorspar mining, and the physical and social costs of widespread industrial disease. For other related articles view the Economy Table of Contents Mining section.